PHOENIX -- The body of a Russian rocket that burned up Tuesday night as it entered the earth's atmosphere set off a wave of excitement on social media and fueled speculation over what caused the flash of light to shoot across western skies. U.S. and Russian officials declined to discuss what the rocket was used for, but experts outside of the government say it was launched as part of a project to bring materials to a space station. They say they rocket's body likely detached from the craft bringing materials into space and burned up as it started to go out of orbit. "It's not something people need to worry about," said David Wright, a space-debris expert who is co-director of the Union of Concerned Scientists. 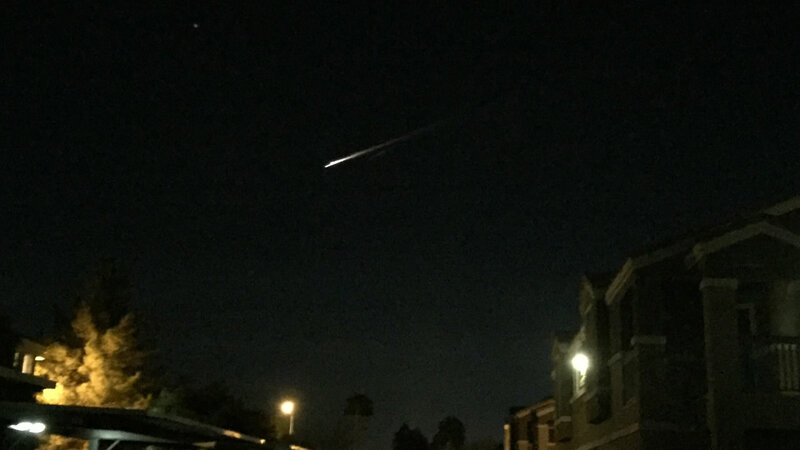 Some speculated that it was a meteor, while others resorted to humor, punctuating their comments by using a rocket emoji and saying the light across the sky looked Santa's sleigh. Some people also expressed distrust about the U.S. government's comments on the rocket. "I was kind of freaked out to see something like that blowing up in the air and you don't know what it is," said Gunnar Lindstrom, who saw the streak of light as he exited a car at his Las Vegas apartment complex and initially believed it was an airplane. Lindstrom, a bartender with a side business as a videographer, said his first instinct was to grab his cellphone camera. "I was upset I couldn't grab my real camera," Lindstrom said. If you took photos or videos of the mysterious light, tag your photos and videos on Twitter, Instagram, or Facebook with #abc7now.